30/04/2018 - Two-spotted spider mite has become one of the most challenging pests to control in cucumber crops not only in Europe but also in Central Asia. With a dwindling range of plant protection products, the problem is further exacerbated due to widespread issues of pesticide resistance. Failure to adequately control this tiny pest can lead to major crop damage. The subsequent reduction in a crop’s photosynthetic ability can lead to significant yield and therefore financial losses. With a wealth of experience controlling two-spotted spider mite in glasshouse crops across both continents, Biobest recommends a multi-pronged approach to optimise control. “A resourceful pest, spider mite can survive cool winter conditions by hibernating in the glasshouse frame, making thorough disinfection between crop cycles prudent”, says Pascal Briand, IPM and pollination specialist at Biobest. As days lengthen and temperatures rise, spider mites become more active. Early detection is key. However, unlike flying pests − such as whitefly, aphid and thrips − spider mite cannot be reliably monitored using sticky cards. To detect symptoms, close crop inspection involving the whole plant, is essential (picture). The pest generally appears first in hotspots − in warmer and dryer parts of the glasshouse. “In glasshouses where two-spotted spider mite is a particular challenge, a preventive strategy can really pay dividends and is therefore highly recommended”, says Pascal. “Firstly, a strong swirskii population − fed with Nutrimite™ − can feed on the first spider mites in the crop. Where hotspots normally occur, we recommend a single introduction of our Californicus-breeding-System (sachets). Suited to dry conditions, Amblyseius californicus can survive at low spider mite density”, he explains. Following regular routine monitoring, the first symptoms of spider mite (hotspots) should be clearly identified using signals clip or other tools. Biobest recommends releasing the Phytoseiulus-System as soon as possible into hotspots and onto surrounding plants. Sprinkling a small amount on to infested leaves, and those above and below, helps prevent the pest spreading. This should be repeated weekly, over 2-3 consecutive weeks, to help establish a good population. The most efficient high-density spider mite predator, Phytoseiulus is a voracious feeder but only of Tetranychus species. Biobest therefore recommends combining it with the Feltiella-System. A gall midge, similar to Aphidoletes aphidimyza used for aphid control, the Feltiella acarisuga larvae voraciously predate on spider mites. 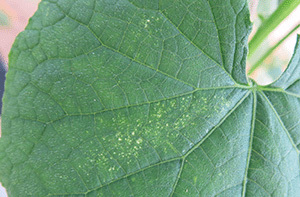 Winged-adults, with good searching ability, can locate spider mite hotspots throughout the crop. “The Feltiella-System contains pupae in a small plastic bucket”, explains Pascal. “The general recommendation is to position one pot per hotspot, and repeat twice. Thanks to its excellent searching capacity, the Feltiella-System may also be used preventively.